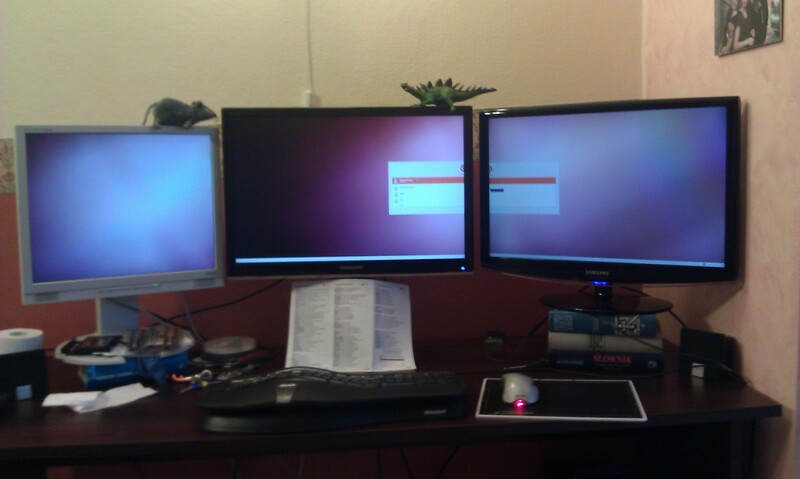 My goal is to achieve one huge X screen on three monitors and two graphics cards. I got a working solution without Xinerama (one X screen on front+right and one X screen on the left) but this of course won't let me drag the windows. Enabling Xinerama makes something really strange to the right monitor, just see the video: http://upload.nowaker.net/nwkr/xinerama-fail.3gp As you can see, it's almost working. Have you tried if you have any better luck with ZaphodHeads? The option is listed in the nouveau man page, but unfortunately I do not have an actual example to show. It would be configured like the "classic" separate-SCREEN dual-head, added with ZaphodHeads options. Thanks for your suggestion. I will google for ZaphodHeads examples and give it a try. In meantime, let me provide some new insights. I believe something trivial is broken here. It's almost working - starts OK but moving a pointer to the right screen starts the fail story. I will also take a look at the source - but I won't be too optimistic as I am a Java developer and don't really know the X or Linux stuff. @Pekka, thanks for your suggestion. I first tried ZaphodHeads but got a message in Xorg.0.log that driver doesn't understand it. I updated all X-related packages to the newest versions from https://launchpad.net/~xorg-edgers/+archive/ppa and apparently it works. The strange thing you saw on the video is gone. I saw it just once - maybe for 5 seconds - after a day-long work. I wrote it from scratch as I didn't find any examples on the Internet. In my case, three Xineramed screens, nouveau > nvidia in terms of performance. Currently I'm not interested in 4 monitors environment but being here I just checked it. X doesn't start. First GPUs monitors only blink several times. I will report a new bug for this issue soon after I test more xorg.conf variations. I changed the status to INVALID since it was already fixed on Git.